Shortly after bombs shredded four Madrid commuter trains and killed two hundred people in 2004, Muslim terrorists justified their gruesome attack as “settling old accounts against Spain, the crusaders.” They were recalling bloody medieval centuries when Spain suffered Crusade and jihad as Muslims and Christians wrestled to control the Iberian Peninsula. But that’s only part of the story. 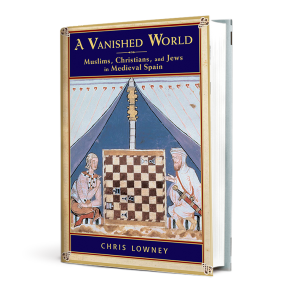 In A Vanished World: Medieval Spain’s Golden Age of Enlightenment, Chris Lowney shows Muslims, Christians, and Jews co-existed successfully for the first time ever in mainland Europe. They created a golden age for each faith, and pioneered innovations that revolutionized Europe, introducing the western world to paper, our Hindu-Arabic number system, advanced irrigation, cotton and citrus, architectural glory, and medical discoveries. A Vanished World ends with the world-changing year of 1492, when Ferdinand and Isabella dispatched Columbus to the New World, vanquished Spain’s last Muslim kingdom, and crowned the Spanish Inquisition’s bitter work by forcing Jews to convert or emigrate. The ‘era of the three religions’ dissolved into religious intolerance that reverberates to the present day. Chris Lowney draws from Spain’s stories of hate and hope to show how only profound conversion of attitude can save humanity from the thicket of religious enmity that ultimately doomed Spain’s unique civilization.